UFC 175 goes down tomorrow night on PPV, featuring two huge title fights in one PPV! 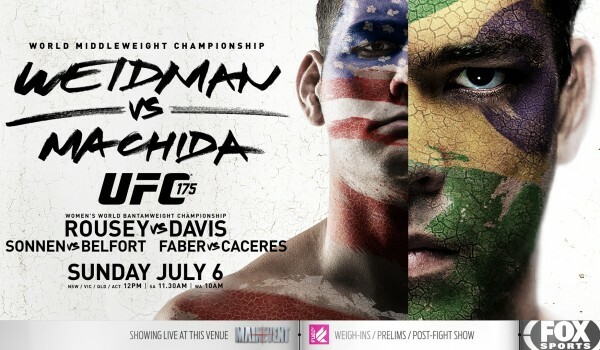 Chris Weidman vs. Lyoto Machida for Weidman’s UFC Middleweight Championship and Ronda Rousey vs. Alexis Davis for Rousey’s UFC Women’s Bantamweight Championship! Those are really some solid fights no matter what you think about the undercard, making UFC 175 one of the few must-buy PPVs thus far this year. So come back at 7pm Eastern time to check out the UFC 175 weigh-ins live here on MMANuts. Because you know you want to see men and women in their underwear flexing while public domain music plays in the background.